Everyone's talking about antioxidants and where to get them from natural sources. The typical topics cover Vitamin C, CoQ10, beta-carotene, and other big-name supplements, but there's a new kid on the block. Astaxanthin, one of nature's most potent antioxidants, is actually found in marine algae and is a fat soluble antioxidant created by single-celled organisms to survive a hundred years of harsh sunlight with no food or water. That's why this unexpected supplement packs a far more powerful antioxidant punch than more common vitamins and nutrients. Astaxanthin is a keto-carotenoid found in certain types of micro-algae grown in aquaculture farms. In the natural world, astaxanthin gives many marine creatures their distinctive red or pink color--from flamingos to salmon. 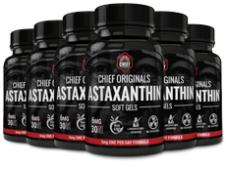 Chief Originals Astaxanthin offers a huge array of health benefits. Upgrade your health by investing in the best supplement that helps keep your body operating at its peak. For a single supplement, Astaxanthin is a remarkable workhorse that offers wide-ranging benefits for the entire body. Tip from the Health Ranger: "Because it's fat soluble, I always take astaxanthin together with an omega-3 or fish oil supplement. The healthy oils transport the astaxanthin to everywhere it's needed in the body, including the brain. Astaxanthin may one day turn out to be the most powerful neuroprotective substance ever discovered from micro-algae." Astaxanthin's antioxidant powers become obvious when compared to the antioxidant potential of Vitamin C and Coenzyme Q10. Yes, I want Chief Originals Astaxanthin today! HOW DOES ASTAXANTHIN STACK UP? Though Vitamin C and CoQ10 are also essential nutrients, astaxanthin is simply more powerful and effective at some physiological processes. Because of its oxygen-quenching properties, astaxanthin helps prevent damaging oxidation in the body, and its free radical-scavenging skills make it a powerful asset for athletes and those who exert themselves on a regular basis. By eliminating many of the free radicals released after muscle stress, you may experience a faster recovery. Because of this, many professional athletes are harnessing astaxanthin's power to supplement their training regimen. 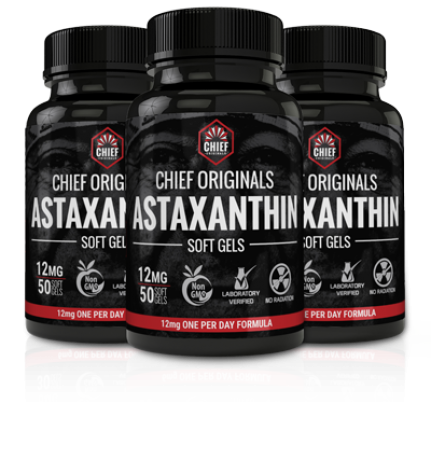 WHAT MAKES CHIEF ORIGINALS ASTAXANTHIN UNIQUE? Astaxanthin can be harnessed from many sources or synthetically generated--but all Chief Originals Astaxanthin is derived from micro-algae. Micro-algae provides the most stable and concentrated source of astaxanthin that's also naturally-occurring, sustainable, and earth-friendly. You won't find pesticides, high heavy metals or contaminants in Chief Originals Astaxanthin. Because it's naturally grown in a controlled environment, there's no chance of pollution or contamination. Just non-GMO, lab-verified astaxanthin that you can feel good about taking. 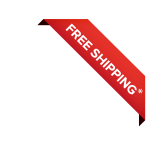 Chief Originals Astaxanthin is also gluten-free, lactose-free, and BSE-free, so you won't have to worry about adding it to your toolbox of supplements. 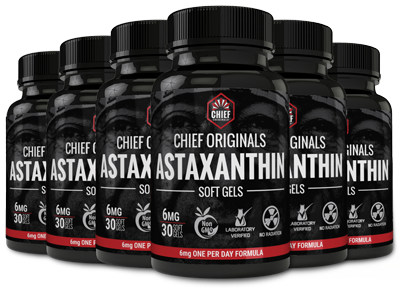 1% of proceeds from Chief Originals Astaxanthin go toward Native American causes, because the Health Ranger Store pays it forward with every purchase. To find out how to get 5% back on your supplement purchase today, sign up for our rewards program!